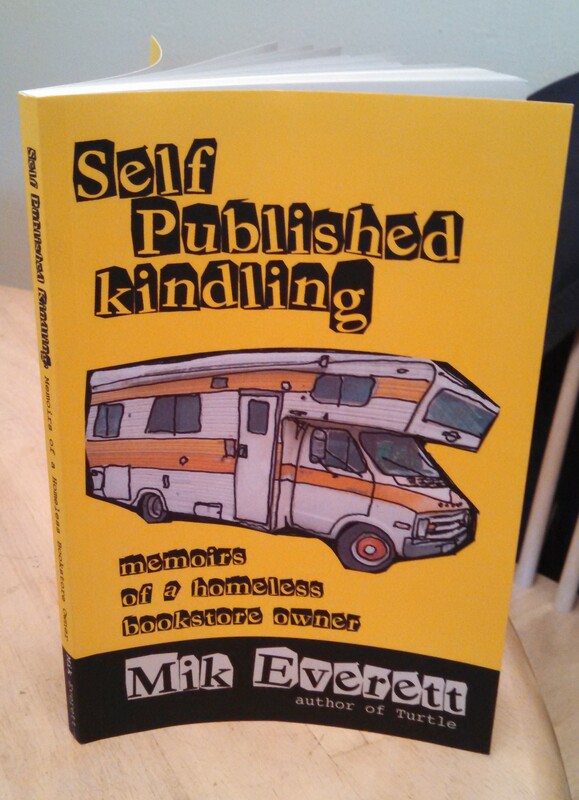 As part of a project I’m doing on the state of contemporary writing, author Mik Everett mailed me a copy of her book Self Published Kindling: Memoirs of a Homeless Bookstore Owner (2013). After reading it, I’m excited for what our generation has to offer the literary world. As Everett so clearly illustrates: we’re one of dreamers and as we set out, so much of what we have to say will be about how we maintained this spirit while navigating the world given to us by our parents. (And if you’ve paid any attention to the news at all, it’s not a great one). Written while living out of a broken-down RV in a Wal-Mart parking lot, Self Published Kindling is about Everett’s experience running a Longmont, Colorado, bookstore that stocked exclusively self-published and regional books. Though the first store of its kind in the nation, Everett quickly discovers that few writers read and even fewer readers want books you can’t find in a Barnes and Noble. She tries to mitigate this through author readings and art crawls, but everyone who comes in leaves empty-handed. Soon she and her partner, John, conclude, “Everybody’s just here to pretend they support art” (48). If you’re an artist who’s ever tried to sell their work, you know exactly what that means. Besides providing a small glimpse into the world of self-published writers, the fact that all this happens within the context of homelessness lends this book a kind of Steinbeck-esque quality. Raising two children with her partner, the pair struggle to keep up with the apartment rent and once evicted suffer through the hoops of getting public assistance. Applying to every homeless shelter in the region, they discover most are at full capacity and won’t have openings for years. Still, she applies anyway, finding little encouragement and grinding her teeth through the process. Eventually, the pair settle on living in a Wal-Mart parking lot, relying on soup kitchens and whatever they can steal from the megastore. As the story flutters between these two worlds–literary and homeless–Everett describes the different people she meets, doing so with a humanity and compassion others may instinctively spare. In these pages we meet young, touring writers who she calls the modern Beats and others who, sleeping out of the backseat of their car, struggle simply to survive. It’s an interesting juxtaposition and one that kept me second-guessing the author and asking, “Who’s actually Beat?” (A part of me suspects that the real Beats are the ones who’ll never pick up a pen). As someone who’s read and reviewed his share of self-published/small press books, Self Published Kindling is one of the few that I can, in good faith, recommend to others. In fact, for anyone interested in this new generation of writers still finding their voice, it’s a hint of what’s to come. Though Everett’s prose is at times weak, it’s the story and what this story means for the rest of us that redeems it. It’s a story of how we twenty-something creatives managed to survive in this changing world, one disdainful of both art and poverty, and the perseverance we retained even when the worst happened. You can purchase Mik Everett’s Self Published Kindling here.